The beauty of the GrimmSpeed Staged Power Packages is that all of the included components were designed and tested to work well together, as a complete system. Instead of piecing together parts from many different manufacturers and hoping that they’re design theories are compatible, consider starting with one of our excellent Staged Power Packages based on your goals! 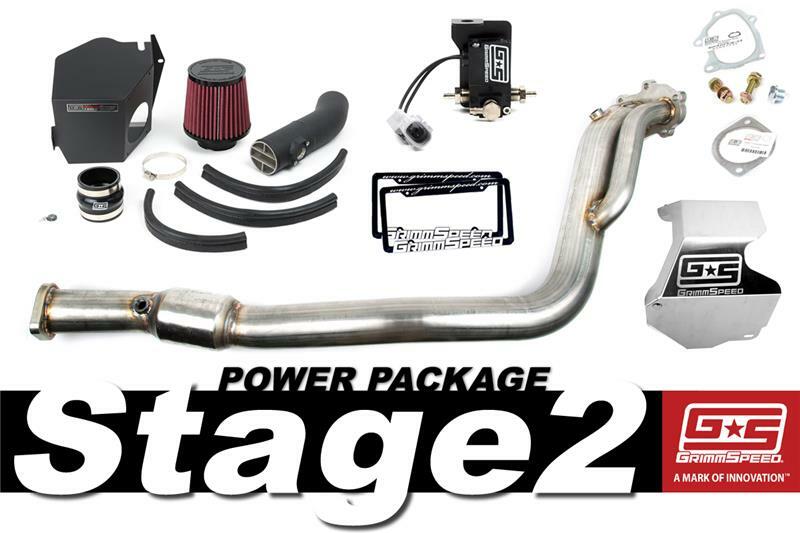 The GrimmSpeed Stage 2 Power Package is a well-rounded kit, offering increased power and torque output thanks to reduced restriction before and after the turbo, as well as a more aggressive street presence thanks to the intake and exhaust tones. The upgraded GrimmSpeed 3-Port Boost Control Solenoid offers more accurate and more responsive boost control and is a must when having your vehicle professionally tuned. The GrimmSpeed Intake adds an additional performance increase by reducing pre-turbo restriction, which allows your turbo to build boost more quickly and more efficiently. The GrimmSpeed Downpipe replaces the extremely restrictive factory downpipe and catalytic converter with high quality 3” diameter stainless tubing and a high-flow catalytic converter (catless option available). It’s important to note that all GrimmSpeed Staged Power Packages require a proper tune. 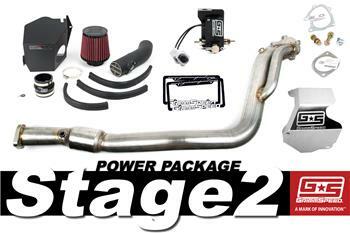 The GrimmSpeed Stage 2 Power Package features the same components of the Stage 1 Package, but further increases the performance of the Turbocharger with the inclusion of the Downpipe. The divorced wastegate design of the Downpipe offers superior boost control, and is the perfect complement to the Electronic Boost Control Solenoid. Over stock, the Downpipe replaces two restrictive catalytic converters as well as increases the tubing diameter. The result is a decrease in restriction after the turbo, an increase in turbine efficiency, and will further decrease time to spool as well as increase boost pressure.